I've been saying it feels like we're living in Nineteen Ninety-Seventeen with all the 90's music and fashion coming back around. It looks like outrageous PE ratios are back in vogue too. Another top today? There are so many different tops in so many different indices that I'm getting confused. When are we going to be there already? If only thorstach the technical wizard stuck around to let us know. Thorstach typically calls the top after several consecutive days of market declines, not on days when the index is up. He's essentially betting on short term momentum. Betting and losing - haha. I know this is all in jest but most of you sound like the 'irrational exuberance' folks before the '08 crash. If its any consolation, I do sort of expect a correction in the next year. It just changes nothing for me. In fact, if the last 10% drop is any indication, I will blink and it will be over. Ha ha! Which one was Thorstache? No, the time to bail was yesterday. Tomorrow we'll know if today was the time to get back in. He ran, and he lived... at least a while. And dying in his bed, many years from now, would he be willin' to trade ALL the days, from this day to that, for one chance, just one chance, to come back here and tell our employers that they may take our jobs, but they'll never take... OUR FREEDOM! Just terrible. All the way back down to where the market (VTI) was yesterday morning. The horror! Top was in! After hours trading is UP to a new high for VTI. It's the after-hours fake high that PROVES the top is in, and the market is going down. I swear, this thread has made me check the stock market more in the past month than I did in the prior decade. +1. I check the stock prices app on my phone WAY more than I should, not because I care if it goes up or down, but because I know if the slightest movement occurs this thread will light up with "Top is in!" Jokes. Can't miss a good dead cat bounce, now can we? Apparently ripped jeans made a comeback, but only for young people. I popped into an "American Eagle" and 1) it looked like the second coming of George Michael, and 2) everybody was 20 years younger than me. Pre-ripped jeans are dumb on so many levels, not least that if you insisted on ripped jeans you could just go down to the thrift store, get some cheap jeans, and rip them. They'd probably look more authentically "destroyed" too, and everyone loves "authenticity", right? I hope the top is in on ripped jeans. I literally never checked the S&P in my entire life until April 2017. Now I check it at least twice every market day. Thanks thorstache. Yes the ONE DAY it was down (Friday) it was definitely down.. End of the World don't ya know? Here I am in VTI, and Friday was an UP day! And more in the aftermarket! 'Normal' corrections are OK....because people typically keep their jobs, etc... The problem in '08-'09 was that many,many people lost their homes/jobs and could not continue to invest at the low point. Hopefully that was just an anomaly and won't happen again now that the banks are 'under control'...although that is debatable. Hopefully that was just an anomaly and won't happen again now that the banks are 'under control'...although that is debatable. Trump is appointing anti-regulation fed reserve board governors as we are sitting here and reading. Those who don't learn from history are doomed to repeat it. Or, as I like to say: Those who DO learn from history are doomed to watch other people repeat it. I agree with you tyort1...I'm seeing an awful lot of people that 'have not learned from history' around here lately! Lots of people with 'the toys' that clearly cannot afford it. I guess we have to embrace the volatility, like a piece of seaweed floating on the ocean surface. I'm rolling over about $50k from an IRA to a 401(k). The check was cut about 10 days ago and I've been seeing the market go up and up and up. If it could please crash back down before the receiving company cashes it that'd be awesome. So everybody please call your least favorite relatives and tell them to sell everything. Your illustrious seer in these uncertain times has returned. Gather around, stay awhile, and listen to my sermon. Dark is the sky on the horizon and a violent torrent stirs beneath the sea! Do you not see the foamy surface? And what a glorious six months it had been! 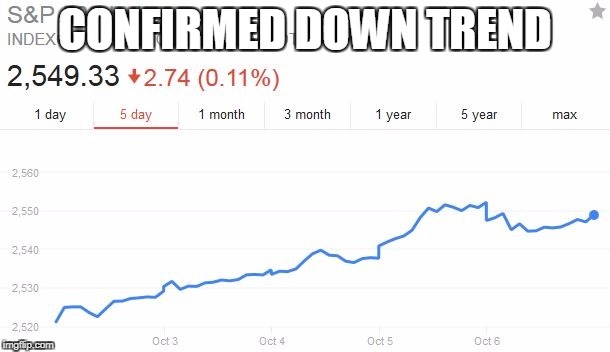 15% gain EM! 10% gain s&p! 1% gain garbage tsx! The great seer spoke of truth and only truth! The econ growth continues to slow but the residual momentum is still significant. The current inflation down"cycle" is likely to end in the next few months, the so called wage growth anomaly will finally be spotted and recognized, which is likely lead to our eventual undoing. I get more bearish every passing day regarding the fundamentals, but you need not trouble yourselves with the burdens only the great can carry, for the burdens are heavy indeed. There is a famous saying (or did I just make it up), 50% of the gains in every bull run occur in the last 10% of the time, AND WE ARE NEARLY THERE (time-wise)! Small dips may come until then but do not weaken your resolve. Bathe in the warmth of the sun, for you are the faithful, the righteous, the strong! A great and terrible storm is on the horizon, it is coming. When the time comes, I will be the beacon of light you should look for. The great seer speak truth and only truth. These words are true. Alright sermon is over, go back to work and create some value for me, minions. So . . . you're calling the top? I kind of hope there is a drop soon, so all the pundits and armchair experts will just shut up about it. We have a whole round of "told you so"s to look forward to! Don't take me for some conjurer of cheap tricks! I am not trying to help you! I am trying to rob you! my calls had been pretty on point so far, let's see if I continue to get lucky. Anisotrophy I'll be your minion anytime you want. Is THIS the new top?? Globally growth is gaining, not slowing. That's why the stock market is gaining the most in the international sector and in those parts of the US market that have international exposure, that, and the falling dollar. The emerging market is doing even better than international developed. SP 500 is doing better than US small cap. Glad to see someone else sharing the belief that econ and market move together. I was mostly referring to the great US&A in April, aka the source of all that's greattm and wonderful peopletm, the best reallytm. And frankly, it is the only one that matters as far as broad market timing is concerned. Sing with me: "America! America! lalalalala!" Yes, globally (outside of USA) growth had been gaining, personally I feel it could last a few more quarters but I don't know without seeing the data. It makes great sense that the global growth would be accelerating after the usa growth rate had slowed. After all, it's like dropping a pebble in a pond, causing a wave propagation. Capitals chase profits, starting with lower risk assets and move further and further towards the higher risk end, that's how the cycles work. With the "peak growth" occurred in late 2014 in the States, I am guessing we are somewhere later in the cycle than many people think. Note, I am not calling the top yet. Still an end-of-session high for the S&P 500 I believe. Doesn't really matter though haha. "The collapse of the 1994 NAFTA trade deal would send shock waves throughout the global economy, inflicting damage far beyond Mexico, Canada and the United States. " Yet another way in which this administration may sabotage the economy.